Home » World » South Asia » Haiyan Typhoon Claims Over 10,000 Lives in Philippine! The Haiyan typhoon that has hit Philippine has made massive damages and might have well claimed over 10,000 lives in one city alone. This happens to be one of the worst storms on record to sent giant waves washing away homes, school and airport buildings. Ferocious winds ravaged several central islands, burying people under tons of debris and leaving corpses hanging from trees. He said that the storm surge caused sea waters to rise 6 meters when Typhoon Haiyan hit Friday, before crossing to Tacloban. “The water was as high as a coconut tree,” said 44-year-old Sandy Torotoro, a bicycle taxi driver who lives near the airport with his wife and 8-year-old daughter. “I got out of the Jeep and I was swept away by the rampaging water with logs, trees and our house, which was ripped off from its mooring. “When we were being swept by the water, many people were floating and raising their hands and yelling for help. But what can we do? We also needed to be helped,” Torotoro said. In Torotoro’s village, bodies could be seen lying along the muddy main road, as residents who had lost their homes huddled, holding on to the few things they had managed to save. The road was lined with trees that had fallen to the ground. “It was like a 747 flying just above my roof,” he said, describing the sound of the winds. He said his family and some of his neighbors whose houses were destroyed took shelter in his basement. Reports are still coming-in on the extent of devastation that Haiyan has left behind. 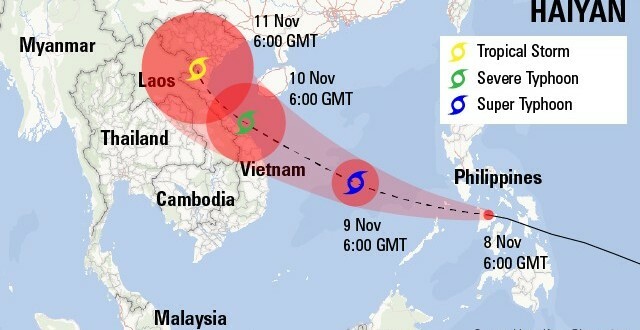 The next in Haiyan’s path is Vietnam, who are preparing themselves for the worst. Harry Potter theme park to be opened in India? Where an IT employee goes wrong! Previous: Chrysler Recall: 1.2 Million Trucks with Defective Steering System? Next: Thor: The Dark World Zooms To Top in Box Office with $86 Million!